Boxes ship flat - easily folds into shape in seconds. Plain, high intensity black cardboard stock paper, no words or designs, for labeling by the customer. Change your vial box labels frequently using regular Avery® style labels for production lot changes or to prevent your products from becoming counterfeited! 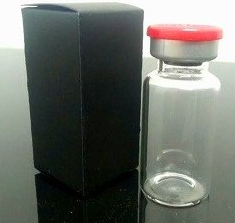 When determining the size of vial box to purchase, be sure and measure your vial with the stopper and seal already attached to the vial (not simply the vial itself).